Whether you’re flying on a business trip or taking a vacation, you can rely on the Embraer Phenom 300 to bring you a cozy experience. This aircraft has the interiors and facilities to make sure you’ll have equally enjoyable and productive flights. One of its standard features would be a comfy passenger seat which can be reclined. On each side of the seat, you’ll find it has a pull out table where you can enjoy your snacks or work on your laptop. As part of the Embraer Phenom 300’s in-flight features, WiFi access lets you stay connected with your friends, family and professional networks. Are you flying to present for a business conference? Then you can conveniently use the plane’s internet connection so you can prepare your slides and update your cloud based files. You can even stay on top of your projects by catching up on your emails. Leisure travelers can also use the connection to watch their favorite movies while flying. To make the most of your flight, it’s always best to confirm the Embraer Phenom 300’s exact facilities with your operator. Know more about the plane’s specifications and charter for your very own flight today. As you hop on board the Embraer Phenom 300, you’ll find it has stylish interiors and complete facilities for you to have a comfy flight. Its standard, leather or suede-made passenger seats can be laid flat so you can take naps and rest throughout the trip whenever you need to. This aircraft also has a galley to prepare your refreshments such as wine and cheese, depending on what your operator has prepared. At the rear of the cabin, you’ll also find the plane has a lavatory to ensure you’ll stay comfortable while flying. 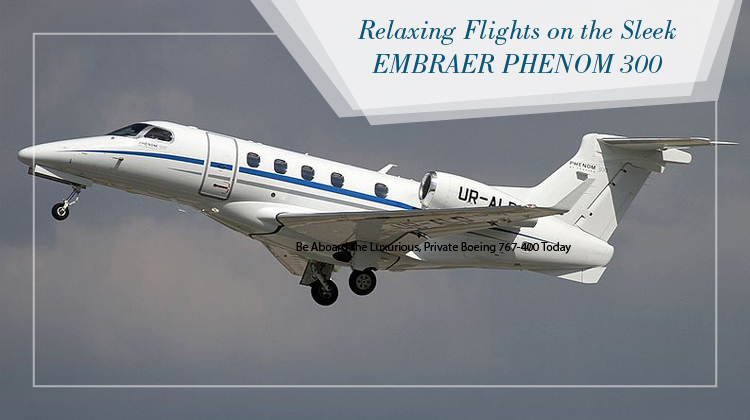 With the coziness and enjoyment you’ll experience on the Embraer Phenom 300, you’ll feel like your aerial journey has been abruptly cut off upon landing. Still, you’ll be glad to find you’ve reached your intended location at the most efficient ways possible. The aircraft performs in fast speeds, it can fly to its maximum altitude within just 15 minutes. If you’re flying from Toronto, Canada, you can reach as far as Nunavut or Mexico City, Mexico on the Embraer Phenom 300. Will you happen to reach the maximum range of this aircraft? If so, it would be advisable to confirm its allowable baggage load and passenger count from the operator. In general, a lighter plane lets you reach farther destinations at much faster paces. 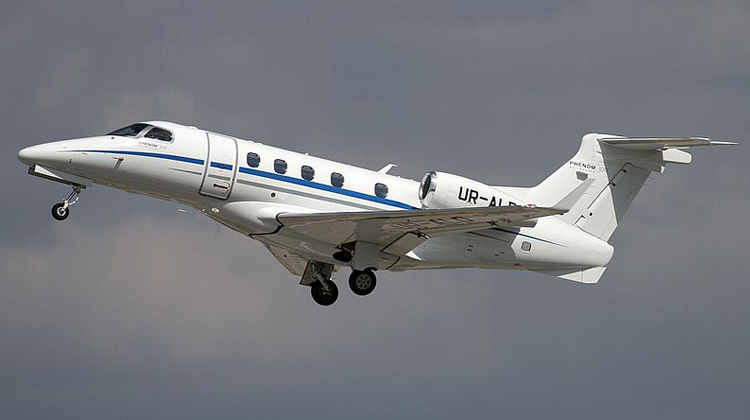 Manufactured by a Brazilian company, Embraer, the Embraer Phenom 300 had its first flight in 2008. It was a development of the Phenom 100, to answer the market’s need to have a bigger aircraft which can fly from or to smaller airports. Today, it has over 300 units being flown all over the world.